EFNMS, the European authority on maintenance and asset management, has awarded the organisation of the 2018 edition of the Euromaintenance congress to BEMAS, the Belgian society for Maintenance and Asset Management. 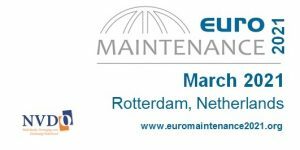 Euromaintenance, since 1972 the most important European conference for Maintenance, was for the first time organised in Belgium in 2008. Up to present, Euromaintenance 2008 was the most successful Maintenance conference in Europe, with more than 750 participants from 51 countries all over the world. Euromaintenance 4.0 aims to go beyond the successes of 2008. In order to make Euromaintenance 4.0 one of the best conferences in our field ever, BEMAS has partnered with Reliabiltyweb.com, the wellknown platform focused on information delivery for maintenance reliability leaders and asset management professionals. Euromaintenance 4.0 is also supported by EASA European & World Chapter, who will deliver a dedicated motor systems 4.0 track at the conference. HINT: Are you a member of one of the 23 European national maintenance societies represented at the EFNMS? Ask you National Maintenance Society for a discount code and you will receive a 10% discount on your registration. This discount is valid on any selection and is applied at the end of the registration process (click here: to find your National Maintenance Association). What to learn at Euromaintenance 4.0? On the verge of the 4th industrial revolution, IoT and predictive analytics are bringing unseen possibilities in maintenance, reliability and condition monitoring. Euromaintenance 4.0 provides a comprehensive and attractive agenda of learning opportunities for CTO’s, asset managers, group maintenance & reliability leaders, maintenance & reliability engineers, condition monitoring specialists and operational managers working in asset intensive industries in Europe and the rest of the world. The conference and workshops focus on disruptive technologies without omitting the essential basics and best practices in the field of maintenance, reliability, condition monitoring and asset management. Euromaintenance 2018 runs from September 24th till September 27th 2018 in Antwerp, Belgium. Find the detailed programm on www.euromaintenance.org. Join the Euromaintenance LinkedIn group or send us an email if you want to be kept up to date on the conference, the call for speakers, or the possibilities to showcase your products and services at the international exhibition linked to the conference.